Dial Books for Young Readers, 2017. 40 pages. She gets that across in the book, with the words “he just kept drawing” showing up as a refrain on most spreads. 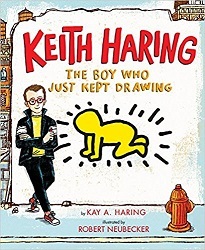 The artist does a great job capturing the spirit of Keith Haring’s work. His unsophisticated but intricate lines are something that naturally appeal to children, and keeping that spirit works wonderfully in a picture book. When he was little, his father taught him how to draw dogs and fish and funny things. His dad would draw a line. Then Keith would draw one. Soon, the whole page would be full. From that time on, Keith never stopped drawing. The story gives us some highlights of his short life. He’d even do murals with children. He’d draw in chalk on black spaces in subway stations. “WHY do you draw all the time? WHY do you give your artwork away? WHY do you draw on buildings, on people, on clothing, on furniture, on subway walls, on cars, on skateboards, on walls that belong to no one, and on things to be thrown away? Keith stopped drawing, just for a moment, and answered. This entry was posted on Saturday, November 3rd, 2018 at 10:03 pm and is filed under Art, Biography, Children's Nonfiction Review, Starred Review. You can follow any responses to this entry through the RSS 2.0 feed. You can leave a response, or trackback from your own site.